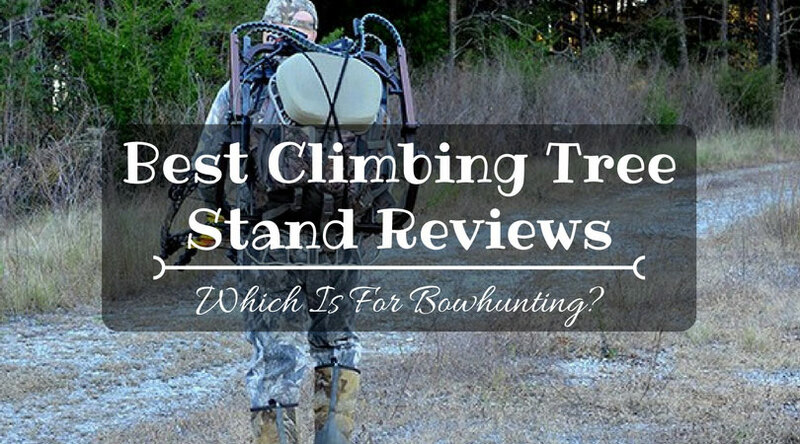 Best Climbing Tree Stand Reviews for 2017 - Which is for bowhunting? 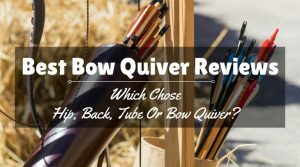 →Best Climbing Tree Stand Reviews for – Which is for bowhunting? 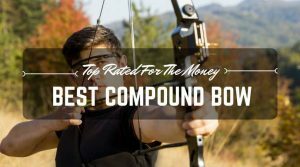 Best Climbing Tree Stand Reviews for – Which is for bowhunting? If you like to hunt or enjoy nature, looking for the best climbing tree stand is probably something you’ve been after. There are many models on the market – some more advanced than others, which are simple. Some are designed differently. Some are designed for all purpose weather, while others are made to have up only during the summer season. When you are looking to purchase a climbing tree stand to suit your needs, you will want to do a little research to find out what will work best with your hunting style. 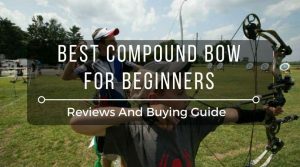 This guide will walk you through the best climbing tree stands on the market, and include pros, cons, and a little bit about each one. 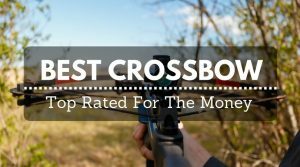 Best Climbing Tree Stand Reviews for 2017 – Which Is For Bowhunting? Climbing tree stands are made by many companies. Some climbing tree stands are more elaborately made than others, which are simple and easy to use. 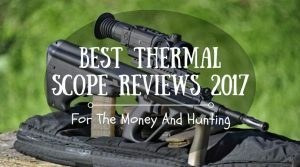 Some are made safer than others, and can support more weight and are designed with the safety conscious hunter in mind. Some tree stands are also designed with comfort as a big feature, making those hours of sitting up in a tree way more comfortable and easy to endure. What makes a tree stand the best will vary in opinion from person to person, so you need to decide which of these things are the most important to you. m From comfort to safety to user friendliness, these are things to take seriously when purchasing a new climbing tree stand. When looking to buy the best climbing tree stand for you, comfort is a big deal. If you plan on spending a great deal of time in the tree stand, you are going to want something that will allow you to spend those hours sitting comfortably, and not hurting your back, legs, or knees while sitting. These comfortable climbing tree stands can have a chair like seating complete with a fabric or even memory foam cushion, allowing you to enjoy spending the day outdoors hunting or simply observing game from afar. Some of the more comfortable designs tend to have a multi positional lounge set up, which allows you to tilt and adjust the seat to your desired level of comfort. This is ideal if you are interested in getting in a quick nap during the day! 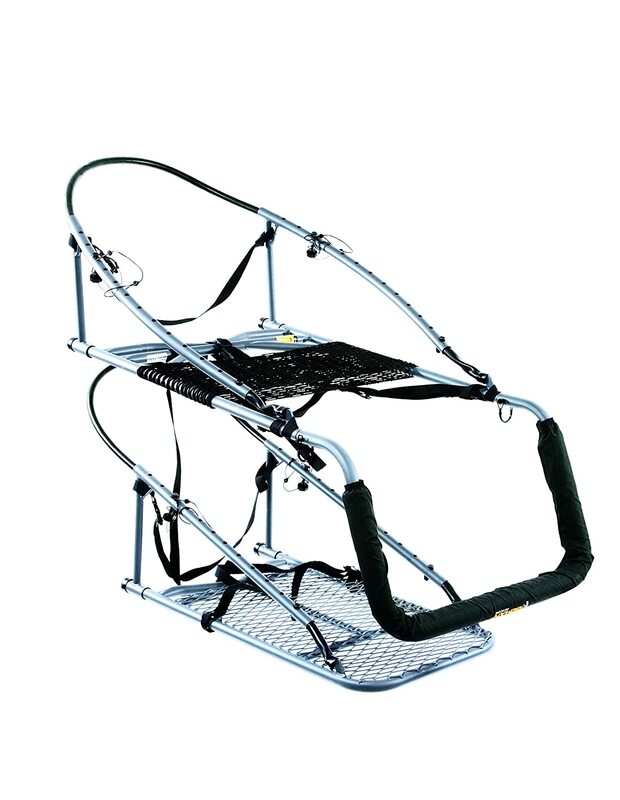 Safety is definitely one of the top concerns when looking to purchase the best climbing tree stand for yourself. You will want to be sure to check the product’s description to make sure that you get the safest product, and always be sure that your tree stand is a newer, safer model – especially if you aren’t familiar with climbing tree stands. 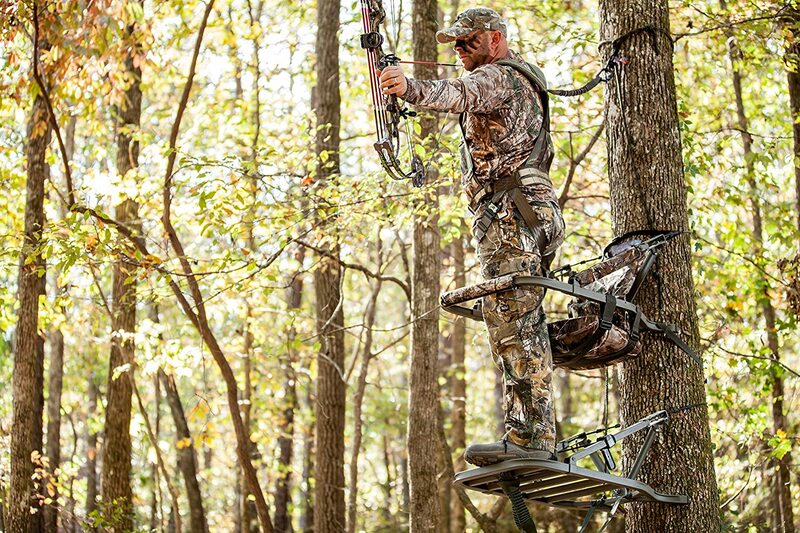 When looking at safety features, keep in mind weight limits on the tree stand, as well as harnesses, adjustability, and fall arrest systems that will keep you from falling from the stand. These features might seem trivial, especially if you are looking for something cheaper, but this is one area you should never skimp on! If you are purchasing a new climbing tree stand, you will want something that is user friendly and easy to use. This is especially true if you are new to climbing tree stands and would like to learn more about them. Some climbing tree stands will have videos, instruction manuals, and clearly labeled and defined features that will allow you to easily set up and use your new tree stand. 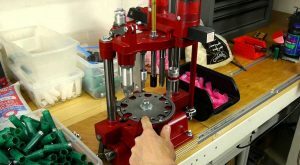 In fact, many of the newer models of climbing tree stands give you access to all of these things, and if you do get stuck trying to figure something out, you can always check the manufacture’s websites or contact them directly, and they can help walk you through any problems that you might have. Whether you are new to climbing tree stands or are looking for a replacement of an older model, shopping for the perfect tree stand can be daunting! Here is a look at some of the best climbing tree stands for 2017, along with pros and cons for each model. The Summit Treestands 180 Max SD Climbing Treestand, Mossy Oak has more comfort options than other models, making it perfect for all day hunts. If you want a tree stand with a wonderfully roomy and padded seat that can hold up to 350 pounds, this is the tree stand for you. The stand itself weighs 23 pounds, and while that might be a little heavy for some, if you are looking for comfort, it might be worth the trade off. Made from heavy duty aluminum, this stand comes with all of the ropes, hardware, ands straps necessary for installation. The stand has an adjustable height feature and allows you to reverse the stand to face toward or away from the tree. 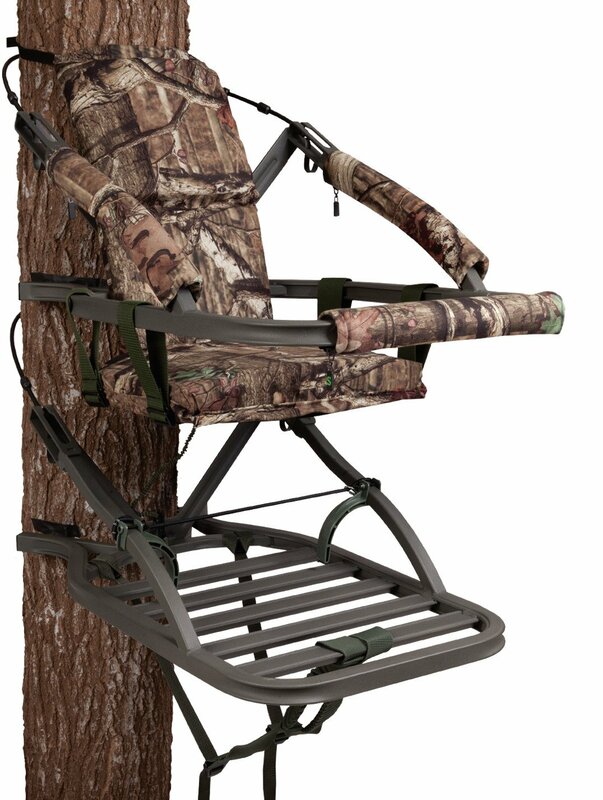 The tree stand can be adjusted for taller hunters, includes a four point harness for safety, and has a comfortable foam seat. When it comes to this tree stand, the parts tend to break a little more easily than other models, making it less durable for the money. Also, although it is supposed to be slip resistant, caution should still be taken when using the stand in damp weather, as slipping can still occur. The Summit Treestands Viper SD Climbing Treestand, Mossy Oak from Summit is a good quality tree stand from a very reputable company. This tree stand weighs 20 pounds, yet can support up to 300 pounds easily. 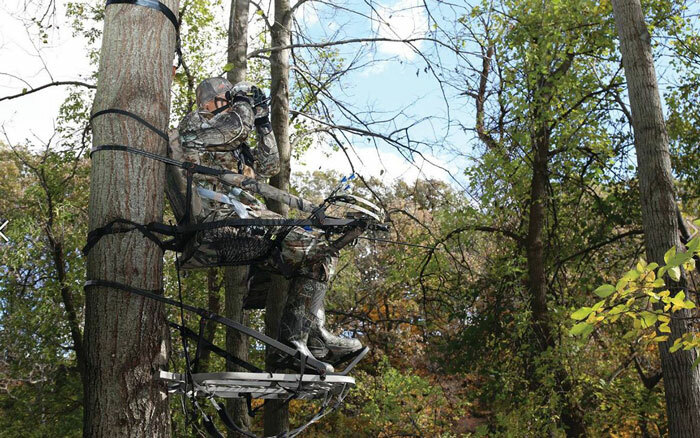 This tree stand offers plenty of safety features, including a full body fall arrest harness that will prevent you from falling from the stand, should something occur. The seat is foam padding for utmost comfort while hunting, and is designed to be quiet, so you don’t need to worry about making too much noise while hunting. The QuickDraw cable retention system included in this stand allows you to get in your stand without worrying about any pins or knobs – so it’s great for use in the dark! The comfort of this will ensure no aches and pains – even after sitting in the stand for an entire day. This particular tree stand tends to have issues with the paint peeling off of the aluminum frame. This is purely a cosmetic problem, but can be an annoyance for those who have spent money and time on this tree stand. The Lone Wolf Hand Climber Combo II Climbing Tree Stand is the ideal tree stand for the hunter who likes to move around in the woods! 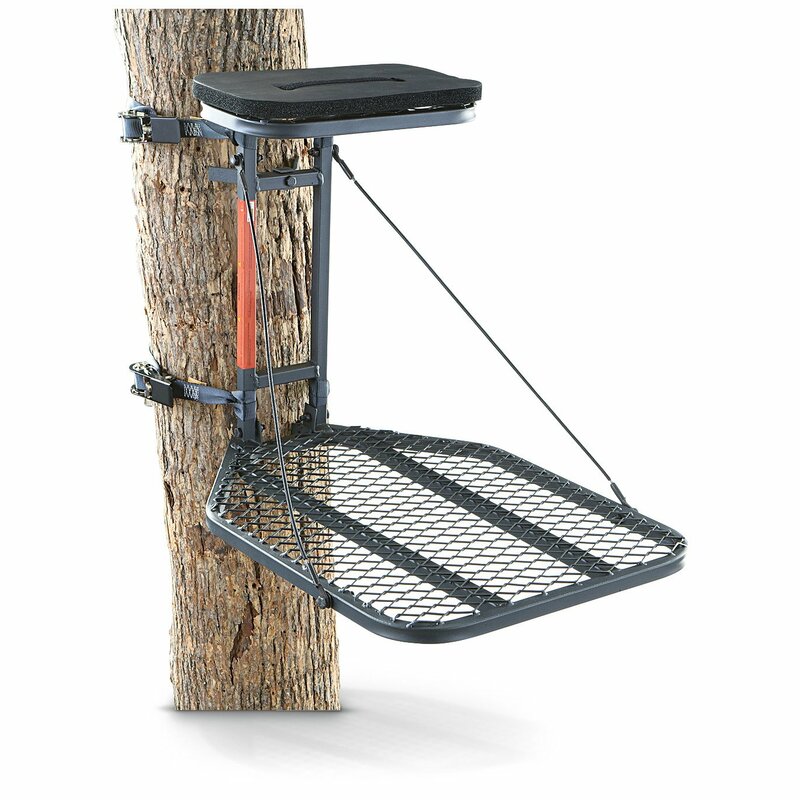 This easy to use climber tree stand doesn’t have all the bells and whistles – but it is designed for those who plan to move around the woods frequently while hunting in order to get that perfect spot. The tree stand can fold down to a mere five inches when packed in, and weighs only 17 1/2 pounds, making it super easy to carry around. 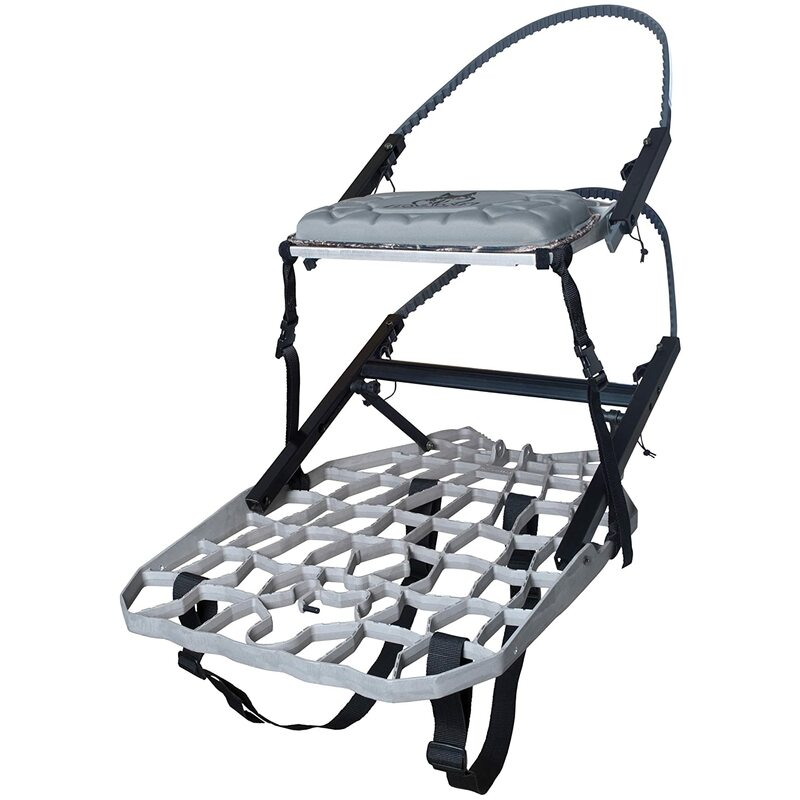 The seat pad makes it comfortable, while the heavy duty aluminum construction allows you to feel safe and ready to take on whatever nature throws at you. For archery hunters this tree stand has a bow holder, and the six point fall arrest system will keep you safe while using. The 350 pound weight limit is great for bigger hunters, as well. The design of this tree stand makes it difficult to use on certain trees, such as black pines, as the teeth are unable to grip the tree’s surface adequately. Because of this, it might be a good idea to test it on certain trees before actually going hunting, so you can be sure of which are the safest ones to use it on. The Ol Man Multi Vision Steel Tree Climber is made entirely of stainless steel and offers hunters three ways to hunt while using the stand: straight bar, foot rest, and gun rest. The seat is made of mesh and will remain comfortable, even after hours of use. This stand is incredibly quiet, which allows you to stay silent throughout your hunt, never alerting game to your presence. The tree stand has a 300 pound weight capacity, and is quite durable, so you can expect years of use from this stand. Based on the weight (nearly 30 pounds), and the square shape of this tree stand, it can be an uncomfortable climb up the tree. The weight alone and the different shape (most stands are oval), can make getting up a tree with this stand a bit more difficult than others. The Guide Gear Hunting Hang On Tree Stand is a lightweight and portable tree stand that can be carried and used almost anywhere easily. This tree stand weighs only eighteen pounds, making it easy to carry around on hunting trips or expeditions. The stand has a foot platform, as well as a padded seat, allowing you comfort while you hunt. The frame is lightweight steel and is durable, so you can use this stand for years to come. 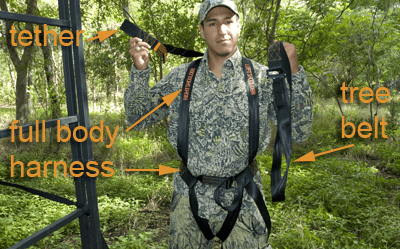 The stand includes two ratchet straps and an FAS safety harness system to keep you safe and secure while you hunt. 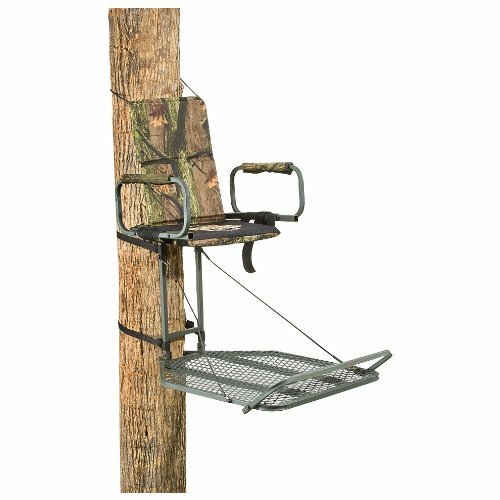 This basic, yet easy to use tree stand is a great way to have a simple and uncomplicated climbing tree stand on your next hunting trip. The tree stand can easily hold up to 300 pounds, and is simple and easy to use. 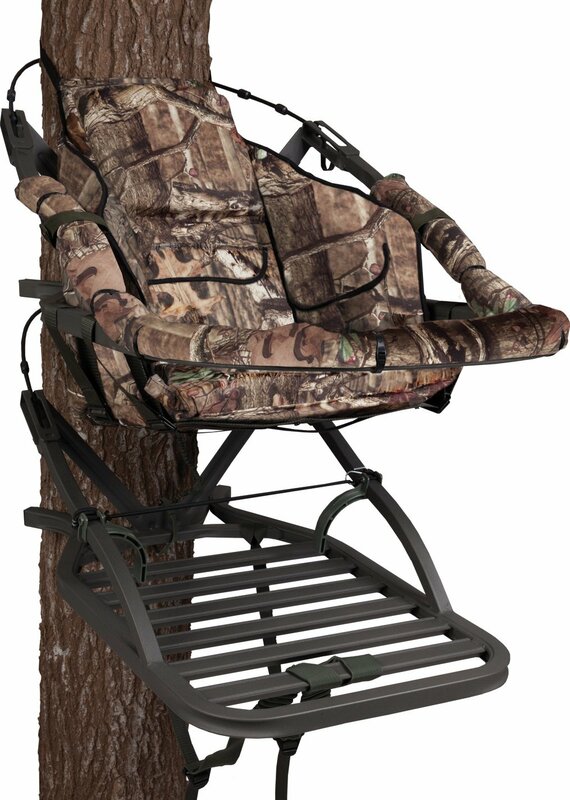 Padded armrests and a padded back allow for comfort while hunting, and the stand features basic safety features, such as an FAS safety harness and everything you need to safely mount the tree stand to a tree. The steel construction features green powder covered surface in order to resist corrosion, making this an ideal stand for all kinds of weather. This tree stand has an issue with noise – the seat isn’t all that padded, and can cause a lot of noise when sitting in it or standing up. The noise can easily scare away game, and this can pose a problem for the serious hunter. Also, the padding isn’t as great in this model as it is in more expensive models. Using a climbing tree stand can really make all the difference while you are hunting, and these can be valuable tools that you turn to again and again. However, it is important to remember to stay safe while using them. Another safety tip for using climbing tree stands is for you to be sure to inspect your equipment each time you go out. Before and after using the climbing tree stand, it is important to be sure to check for tears, loose screws or faulty construction to ensure a safe trip out each and every time. 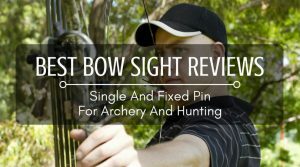 Finally, be sure to be safe with your bow or firearm, as well! 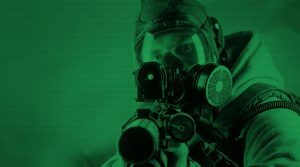 When climbing or positioning your tree stand, until you are situated and ready to fire, be sure to keep the safety on. It is an even better idea to make sure that you do not load the firearm until necessary, in case of a fall when climbing up the tree with the tree stand and firearm together. Choosing the best climbing tree stand can be a task, but when you read up on the important features, such as safety harnesses, comfortable seats, and durable construction, you are bound to have an easier time choosing one. 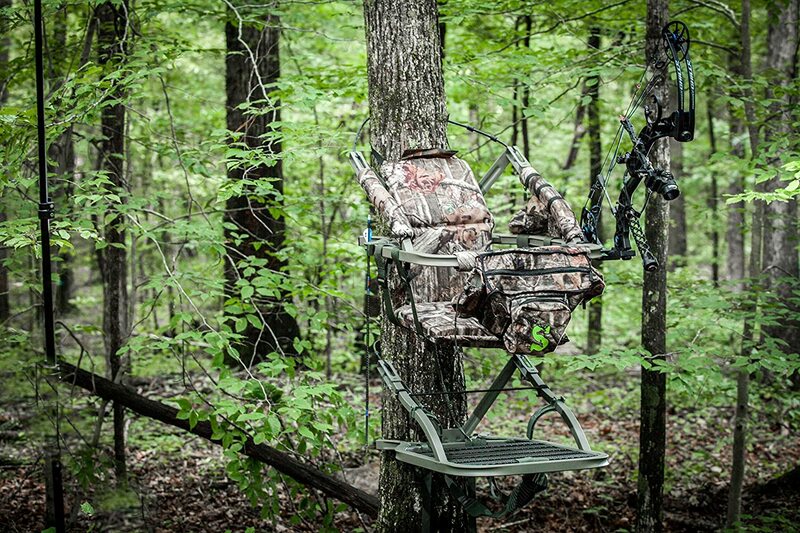 Some tree stands offer padded seats, while others focus more on using mesh seats and focus on portability. Some tree stands are more portable than others, while others focus on being able to hold more weight. There are a variety of climbing tree stands available on the market, and each of them have something different to offer to the consumer, allowing you to choose the right tree stand for you based on what is most important.